An oxygen generator consists of two tanks filled with a sieve, which provides a concentration of 93% oxygen for all your on-site equipment that uses oxygen. 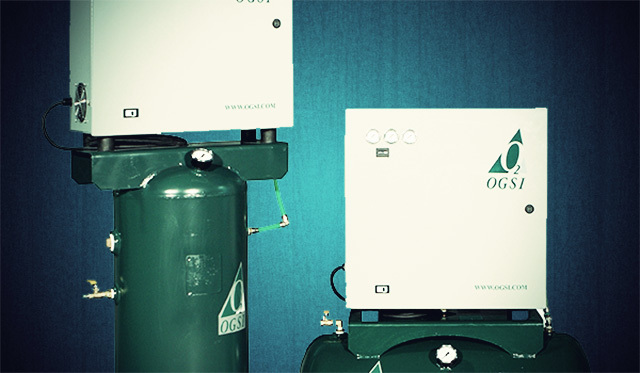 The oxygen generator uses the Pressure Swing Adsorption (PSA) technology to create oxygen. During this process, oxygen is separated from the components in the air. No, there is a lot of confusion as to the difference between a concentrator and a generator, but the variations are important to take in consideration in a veterinary clinic. A concentrator is a small medical system for personal use, which is less expensive than a generator. However, a concentrator can’t be used in a veterinary clinic because it does not have enough power to provide the necessary oxygen to the equipment. Contrary to a concentrator, a generator produces 90 PSI, which allows you to use the flush of your anesthesia machine. Another advantage of the generator is the reservoir, which will continue to give you oxygen during a power failure (the size of the reservoir varies with the different models). Still, we recommend keeping an oxygen tank on hand in case of an emergency or an extended period without electricity. To better analyze your oxygen use, try to visualize your clinic’s future needs and not your actual oxygen use. For example, do you plan to move, do you expect to enlarge your clinic, or do you soon plan to buy another anesthesia machine, oxygen cage or incubator? Since the oxygen generator has a long life expectancy, it is essential to plan your purchase with the needs of your clinic in mind. The main advantage of having an oxygen generator is the savings of up to 80% of your actual oxygen expenses. Generally, we count the payback of a generator from six months to two years depending on the model and your oxygen use*. Having an oxygen generator in your clinic will avoid dependence on the delivery of cylinder oxygen. These systems will also permit you to provide the newest therapy, Hyperbaric Oxygen Therapy, in veterinary medicine (HBOT). It also eliminates the danger of having liquid oxygen at the facility (LOX). In addition to this, an oxygen generator is a great contribution to the environment since there are no related CO2 emissions. What is the lifespan and what maintenance is needed for an oxygen generator? We can estimate the lifespan of the compressor between 10 000 and 20 000 hours of use and the lifespan of the sieve about 15 years. There is not much maintenance needed on these oxygen generators. We recommend changing the filters every six months. To make the generator work properly, you need to make air changes in the room where the system is installed. The number of air changes per hour will vary on the size of your generator and the size of the room.